This is my first Plexi-glass easel Perpetual Desktop calendar, and it is called; “W.O.W!!! 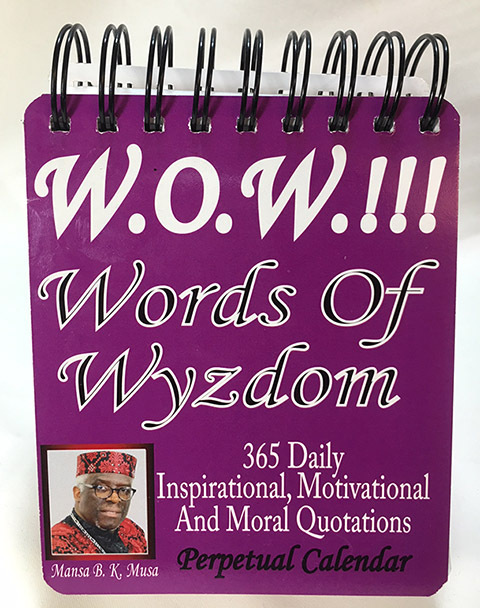 Words Of Wyzdom.” It has 365 powerful quotations that are Inspirational, Motivational, Educational and Moral. If you enjoy reading daily Proverbs and Quotations, then here is an excellent opportunity for you to have a Perpetual Calendar sitting on your office desk, in your bedroom, or on top of your dining room table. As a gifted writer of proverbs, quotations, poems and short stories, Mansa Beycando KanKan Musa has an amazing ability and talent to bring any proverb, quotation or story to life. He was born and raised on the island of Trinidad in the West Indies, with a strong African family traditional background of writing proverbs and story-telling. 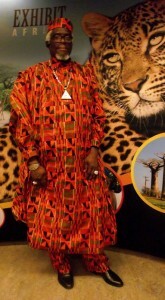 His father was one of the best known “Griot” in the village where he was born and spent the earlier portion of his life. A “Griot”, pronounced as GreeO, (the “t” is silent) is a West African word for a proverb or story teller. A Griot has to be knowledgeable in the cultural identity and tribal history of his/her people, as they are the guardians of the ancestral wisdom, proverbs and knowledge. A Griot must possess the ability to tell many stories or proverbs and quotations from memory as a good Griot never writes anything down. Mr. Musa is not only an aspiring “Griot”, but also a self-publishing author and writer and has previously written four books: Beauty On The Wings Of A Butterfly – A collection of over 480 quotations. Words Of Wise+Dom – A book with 54 inspirational stories. The Guiding Light – A collection of over 450 perpetual daily quotations. L.I.S.A. Love Is So Amazing – A book comprised of 54 romantic poems. With the launch of his new perpetual calendar of wisdom, each proverb or quotation has been written with an inspirational, motivational, spiritual and moral lesson attached to each. It is appropriately called; “W.O.W!!! Words Of Wyzdom” and would be available for sale from the 27 November 2017. This thought provoking once in a lifetime calendar is ideal if you were thinking of giving someone a beautiful gift that would last them forever. It would make an ideal gift that you can give to your family, friends, neighbors, Pastors, Ministers or co-workers at any time of the year for: Christmas, Kwanzaa, Birthdays, Graduation, Anniversaries, Going Away Present, Baby Shower, Weddings or as a “Thank You” gift. It’s regularly priced at $45.0 each, but for the official launching, the introductory price is drastically dropped to $36.00. There is “FREE SHIPPING” on all ORDERS over $50.00 in Canada and $75.00 for in the United States of America. “W.O.W!!! Words Of Wyzdom Perpetual Calendar easel perpetual desk calendar measures 5″ Wide x 6″ Height and sits on a sturdy plexi-glass easel-style stand. The covers are made from 14 points card stock board. The calendar is printed on 24 lbs. offset quality paper and features a different quote for every day of the year. 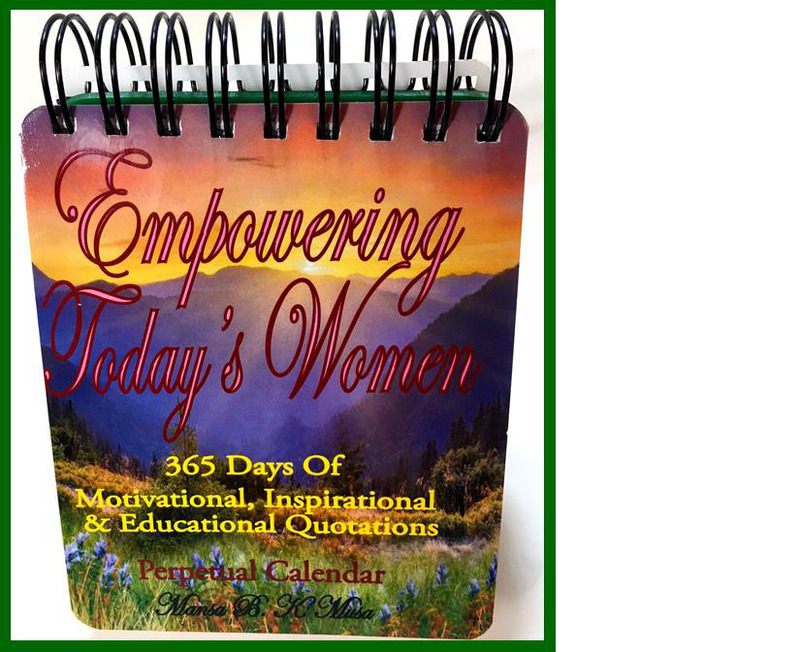 “EMPOWERING TODAY’S WOMEN Perpetual Calendar measures 5″ Wide x 6″ Height and sits on a sturdy plexi-glass easel-style stand. The covers are made from 14 points card stock board. The calendar is printed on 24 lbs. offset quality paper and features a different quote for every day of the year.